There are sad moments and happy moments in the refugee camps in northern Ethiopia. Many unaccompanied minors flee from compulsory military service in Eritrea across the border to the camps, often hoping they will be able to continue on and go abroad. But they are very young to be separated from their families, some as young as 9 or 10 years old. Once they arrive in Ethiopia, they are not allowed to return to Eritrea. They hope for reunification with their families, but over time they begin to lose hope. Many have suicidal thoughts. The social workers in the organizations help them, but it’s not like having their family. They’re alone. They don’t get enough care. They may not have support – material or psychological. They become anxious and depressed. They become easily angry. They don’t have any information about their families – it creates a lot of stress and anxiety for them. Some try to commit suicide. They leave home believing they may be reunited with their families again one day. When they come to our center, some still believe they will see their families; some do not. And reunification does happen. Sometimes the children come to the camp, and then their mother may be asked by the Eritrean government if she sent her children away. The mother may be fined in this case, or punished and put in prison. She may have her land taken from her. Because of this, and because she may not have the money to pay the fine, she may escape to Ethiopia too. We see families reunited on occasion here. Often it is because the mother may see that the family land will be taken and she will be left with no livelihood in Eritrea, or she may come because she is searching for her child. I had been working with child and adult clients for some time before coming to CVT. My degree is in Educational Psychology and my Masters is in Development Studies, and now I’m completing my Masters in International Cooperation and Humanitarian Aid. Before CVT, I was working at the International Rescue Committee (IRC) as a child protection officer for unaccompanied minors, protecting and responding to situations of risk for these children. We protected the children from abuse, neglect, sexual abuse and exploitation. We also provided support for basic needs. The children are separated from their families so they need shelter, food and protection from harm. We provided holistic support in the Mai Ayni camp. Because of my background, I was interested in CVT and the opportunity to gain experience and specialization in trauma healing for situations of torture and trauma. Exposure to clients with these problems is a new experience for me. My role as counseling supervisor is to do the community sensitizations, where we educate the community about CVT’s rehabilitative care and normalize symptoms to reduce stigma and help people understand that care is available for those who have survived traumatic experiences. I also do intake and follow-up assessments, lead group counseling sessions and provide individual counseling for clients in crisis, especially in situations of suicidal intent. I am the clinical supervisor for our psychosocial counselors (PSCs), who are, themselves, from the refugee community. Also I write reports and provide information for our monitoring and evaluation work, check all the intakes from the PSCs, and make sure we have the information that we need for treatment planning and the materials we need for the program. My work can be very rewarding, but it is also very challenging. Especially with the children, when they know they are not going to reunify with their families, they have sad thoughts and do not feel good. It can be very difficult. I remember when I worked with a client who had suicidal thoughts. Through our counseling sessions, I watched as she began to find hope and resilience, and to minimize her thoughts of suicide. Often when I lead groups, I see improvement by the seventh or eighth session. Our clients tell me their symptoms are improving; I can see how they are functioning better, and I feel good about their progress. During the group this last cycle, there was an Eritrean mother of four children. At the assessment, she was restless and anxious. It was difficult to do the assessment because of her nervousness. After attending the first group, she told me she had a very serious medical illness on top of the gender-based violence she had suffered from her husband. He had tried to kill her in Eritrea. 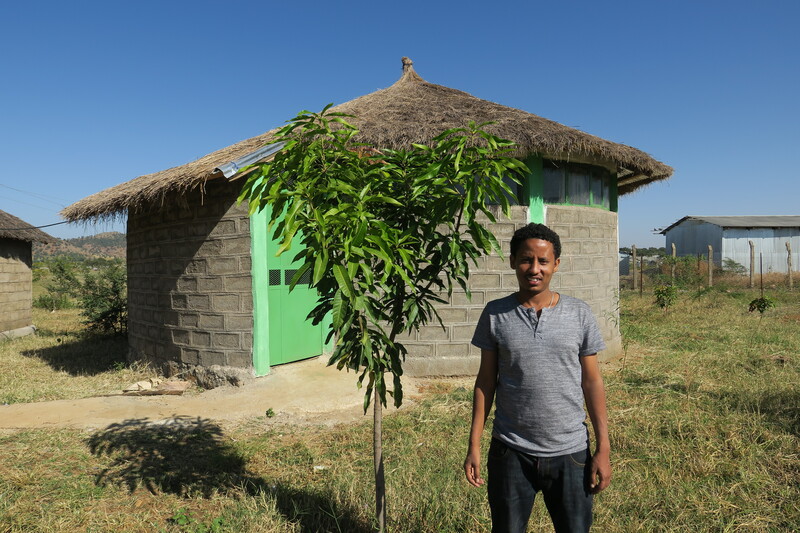 After he tried, she came to Ethiopia, and now she was feeling depression and anxiety. But after the group cycle, she told me should could not even remember how she had been behaving and thinking back when she first got started with CVT. After counseling, she was even assisting and providing emotional support to other group members. She said “I was like this, now I’m like this.” She talked openly about her health problem, and she accepted her situation. She said that she believes she will be able to face her problems. She can be herself and take care of herself and her children. My work is rewarding especially when I see improvements and reduced symptoms. This is when I feel that my work is meaningful. I often see those who want to commit suicide or feel hopeless and helpless. But I see so regularly that they get relief. My work is very meaningful.